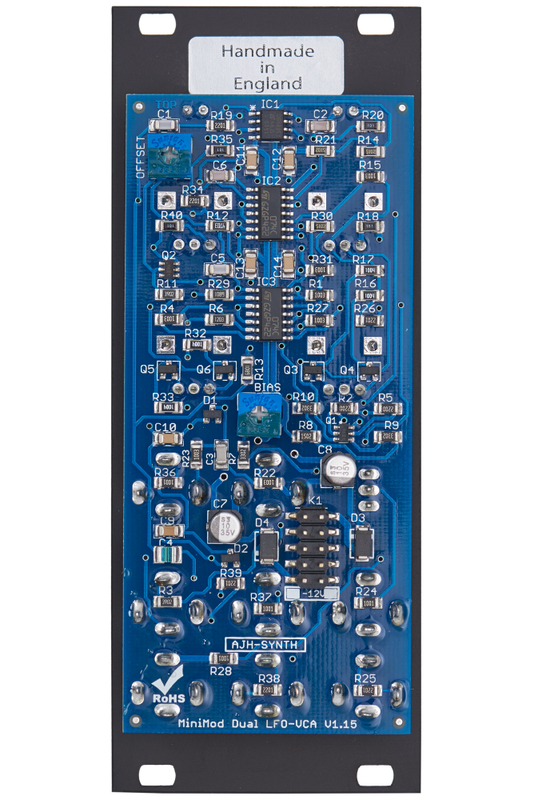 The Dual LFO + VCA comes equipped with two low-frequency oscillators, each featuring a triangle and a pulse output. Utilizing two of the module’s potentiometers, the shape respectively width of the waveforms can be adjusted. Therefore, it is easily possible to transform a triangle into a saw tooth or ramp wave. – Or anything in between. The other potentiometers allow users to adjust the LFO rates. Additionally, the first modulator features a switch for changing its tempo range plus there is a Sync input. 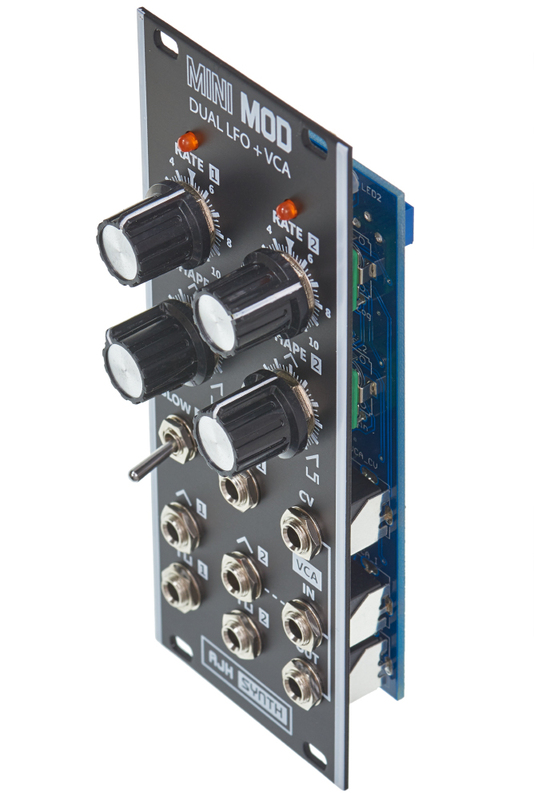 The second LFO is normalized to the module’s linear VCA. It can be controlled via a CV input. This setup is very handy for regulating the low frequency oscillator’s modulation depth via, for instance, the modulation wheel of a keyboard. By activating the circuit’s slow function, it is possible to gauge the first LFO to a frequency range of 0.01 Hz to 2 Hz. Furthermore, there is a Sync input. 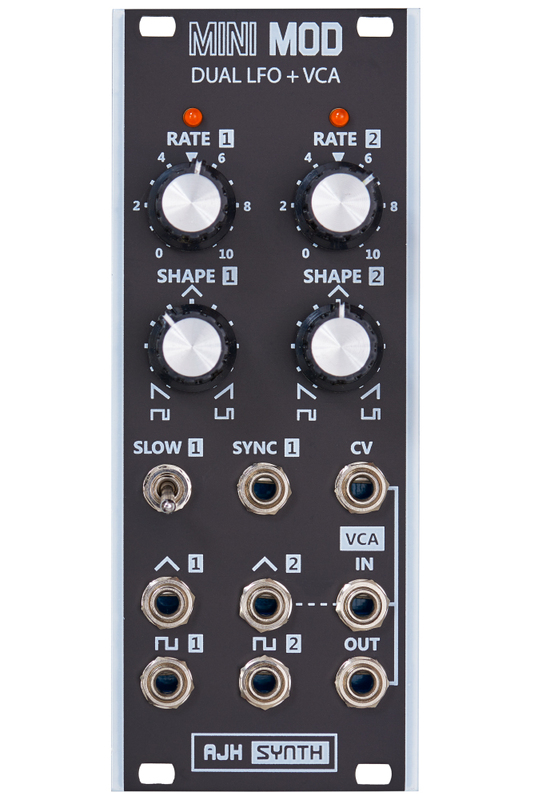 The triangle output of the second LFO is normalized to the module’s linear VCA, which can be controlled via CV voltages. As soon as a cable is plugged into the amplifier’s input, signals coming from the low frequency oscillator are ignored.